Pralines- $13.50 lb. A chocolate & a hint of peanut butter candy delight with pecans! Old Fashioned cooked Fudge- ($8.00 per lb, plain) This fudge is chocolate, smooth and as delicious as the era it came from in the 1960's. Rosemary Pecans- $22.00 per lb. or Current market price on pecans. Rosemary herb adds a unique taste to toasted pecans for a new Christmas treat. Peppermint Patty -$15.00 per lb. Pure peppermint oil in a unique creamy blend! Truffles- $12.00 per dz. Mint — White creme— Chocolate. Brownie Doughnut- $1.50 each, decorated. Sugar Fruit- $3.00 each or 2 for $5.00 Peach, Apple, Lemon or Grapes make a great display within any cookie tray since they look like fruit! Pineapple Square- Homemade filling and a great crust, just like grandma made. Custom Trays are available & need to be pre-ordered as early as possible and pre-paid. 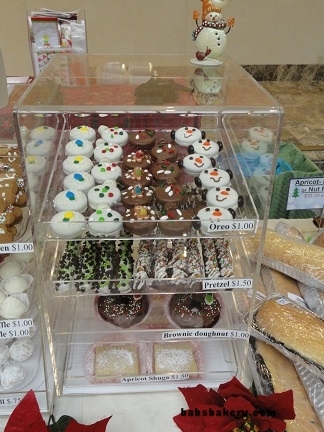 you get to pick from our bakery case! 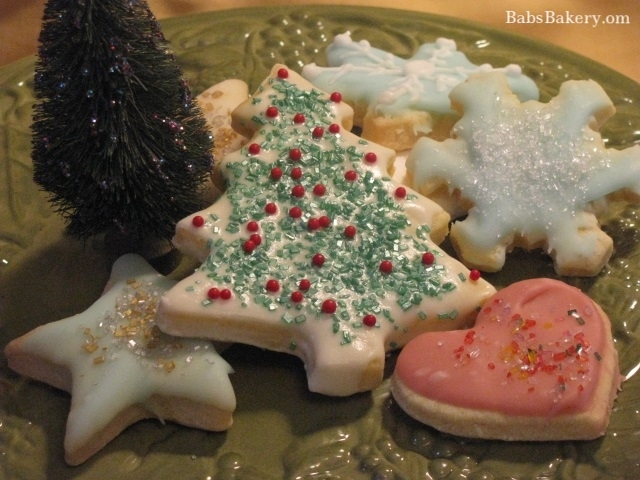 Cut-Out-Cookies- Seasonal & Party time cookies. Medium size Decorated cut-out. $10.00 dozen decorated. Squares of layered fluffiness are filled in the center with- nut, poppyseed or apricot. Kolachi or Nutroll- $10.00 or current market price on nuts. Poppyseed roll- $10.00 or current market price. Cottage Cheese- $10.00 or current market price. This is an old Croatian family dough recipe in that it is a sweet, thick, soft dough. The Croatian dough used for my rolls was a recipe given to me from my great Aunt Rose in 1992. It was a family tradition in her home and soon one in mine, as well as my bakery. She explained the dough to me as, it as a sweet, thick, soft dough other than most she had eaten. One reason is that the dough has eggs, butter, and flavoring, such as vanilla or spices to celebrate the particular holiday. I remember her saying, "The rich, sweet dough always signifies a holiday." Whereas everyday baking of bread dough did not, because it was too rich to consume, and likewise there would be no need to celebrate a holiday if you ate like that all of the time. Although there is plenty of filling, there need to be more dough than filling. This reason is the same as any pastry, one can get sick on too much sweet, and in addition it is better to digest the sweet filling with more dough. (Other examples are: the German bread at Christmas time called Stolen with a small amount of almond paste. In the same fashion, Chinese & Ayurvedic sweets are usually made in the same ratio of sweet to dough). Meanwhile, was called both Nutroll and Kolachi in the tradition I grew up, although most in the Youngstown, Ohio area know it as Kolachi. The dough is scaled at 15 oz. and the filling is spread on according to the way each piece of dough is rolled out. The filling averages about 5 oz. per roll. Sometimes we do not eat it right away and warming the Croatian roll brings back the moistness. I prefer to use my small convection oven, because sometimes I like the top 'toasted' and the center soft. I have found over the years apricot and raspberry tend to dry the dough out quicker, and this method takes away the dryness that can develop. Warm it slightly in the oven and enjoy your Croatian roll! Christmas Cookies sold per dozen. Marble squares--- $9.00 per dozen. Spiced Date bars--- $9.00 per dozen. Ginger Bread Hearts--- $9.00 per dozen. Fruit & Nut Bon-Bon--- $10.00 per dozen. Fruits-nuts -coconut in a bite size fruity ball. Peanut Butter Buckeye-- $9.00 per dozen. Choco-cookie Buckeye--- $9.00 per dozen. Hazelnut Buckeye--- $9.00 per dozen. Pecan Crème Tarts--- $12.00 per dozen. Pecan Crème tarts, an unusual recipe & not too sweet. White Truffles- $12.00 per dozen. White creme center dunked in white chocolate. Snowman Face oreo cookie- $1.50 each. When I have them, otherwise ordered by the dozen. Italian Anisette - $8.00 per dozen. A Christmas favorite for all! Coconut Drops--- $7.00 per dozen. $8.00 per dozen. Crispy & sweet! Peanut-butter drop— $8.00 per dozen. Peanut butter cookie , drop of chocolate in the middle. Kaleidoscope Cookies --- $8.00 per dozen. Colors swirled together in a butter cookie. Thumbprints or Jelly Jewels---$8.00 per dozen. Lemon Shortbread ---$8.00 per dozen. Lemon Zest plays a part in a good cookie! Peppermint Shortbread ---$8.00 per dozen. Chai Shortbread ---$8.00 per dozen. The spices of India compliment this cookie! Chocolate chip Shortbread---$8.00 per dozen. Rich chocolate cookie rolled in powdered sugar. Jo-Java Chocolate Mocha- $9.00 per dozen. Coffee cookie with the bottom dunked in chocolate & drizzled. Jo-Java Vanilla Latte- $9.00 per dozen. Coffee cookie with the bottom dunked in white chocolate & drizzled. Ginger Krinkles-- $9.00 per dozen. Double Chocolate Drops-- $9.00 per dozen. Chocolate krinkles with a chocolate center. Rugelach-- A wonderful Jewish delight. Unicorn horn- A colorful sugar cookie with a hershey kiss for the horn. 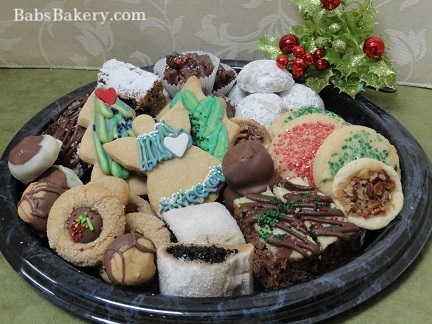 All of the Christmas & specialty cookies or treats have that same great Food Energetic combinations! Our elves were busy baking & creating new cookies this year, but they cannot take full credit. Our full staff of snowmen, penguins, gingy-people, & peppermint smiles help allot. Pre-Order & Pre-Pay for easy Holiday needs!